PORTSMOUTH NH — August Residential real estate sales of home and condominiums in the 13 Sample Seacoast Towns enjoyed modest gains over the same period in 2012, according to statistics recently released by the Seacoast Board of REALTORS. 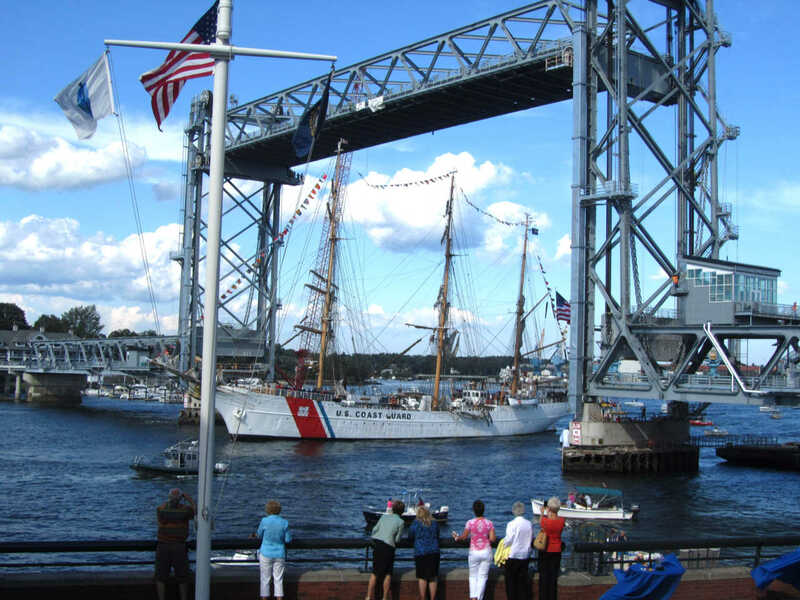 US Coast Guard Cutter “Eagle” sails into Portsmouth NH Harbor for a visit. The 13 Sample Seacoast Towns are Exeter, Greenland, Hampton, Hampton Falls, New Castle, Newfields, Newington, North Hampton, Newmarket, Portsmouth Rye, Seabrook and Stratham. Single family sales were up .9% from 2012, while condos held a 6.5% advantage over last year. Month to month, sales actually declined from July’s record totals with home sales off 15.1% and condo closings off 26.8%. It was a pattern that pretty much mirrored 2012, when July was hot and August recorded a drop in sales for both single family and condos. Meanwhile, the median sale price of a single family home declined 4.3% from last year to $328,750, the lowest number this year since January. Condo units, however, were up .5% from 2012 to $220,000. Finally, single family inventory remained steady at 529 units, two more than last month and a new high for the year. Condominium inventory slipped to 228, the lowest since January. If you’re looking for a home in the Portsmouth NH, New Hampshire Seacoast, or southern Maine area we invite you to visit www.NHCoastalHomes.com for the most up to date and comprehensive list of homes for sale.